As always my good friend and go to person for all things TV, Laura Lee-Lim brings you a taste of what’s new on the Fall Schedule. Today she talks to us about what’s new on The CW – I know it’s one of her favourite channels :). You can always follow Laura on Twitter to get up to date news on all things TV. True to form, the CW schedule is jam packed with supernatural goodness. While there are only three (3) new shows this season, they look to nicely round out the action packed series’ that make up their fall season. With the addition of The Tomorrow People on Wednesday nights, we get to enjoy double the Amell yumminess as cousins Robbie and Stephen takeover the mid-week lineup. I’m not sure if they are next gen humans or a separate race altogether but either way, the series hits all the high points for me. There’s a little action, social insecurity & the need to find a place to belong. Oh yeah, and some cool “powers” that have always been on my “if I had a superpower….” list. In an effort to hype this series & give the last in the trio of newbies some additional promo time, The Originals will air their premiere on Thursday following the series that spawned it (Vampire Diaries) before moving to its regular timeslot on Tuesday nights. While it is a spinoff, this series looks to have a strong storyline all its own with the Original Vampire family going toe-to-toe with the new power in their hometown of New Orleans. Until I started writing this post for Gus, I’d actually never heard of this series. I’d heard of other period shows like the Tudors and Game of Thrones but wasn’t aware that the CW was coming out with a teen friendly version. Guess it’s a good thing then that the execs decided to delay the premiere of Reign. The series will follow Mary Stuart, more commonly known now as Mary, Queen of Scots, as she embarks on a new phase in her life – an arranged marriage. There’s religion, political intrigue & probably a little romance all wrapped loosely in the history of a young girl learning to navigate her royal way. I am intrigued enough to have now added it to my “give it a try” list. 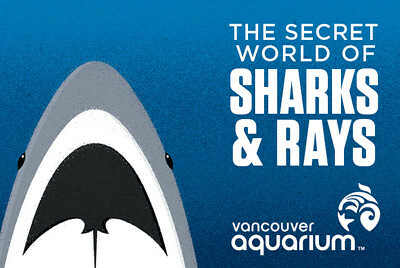 Starting February 7th to April 30th the Vancouver Aquarium will dive into a new feature highlighting The Secret World of the Sharks and Rays. You’ll be introduced to some sharks that live in the BC coast as well as be introduced to some not so famous shark cousins including the Spotted Ratfish. The feature will share with you what makes sharks such great hunters, why are they so fast, what conservation efforts are in place and introduce you to rays at live in fresh waters. “Whether you’re curious about their hunting strategies or the human activities that put these creatures at peril, or if you’d simply like to be awed by their magnificence, The Secret World of Sharks and Rays has something for everyone,” says Clint Wright, senior vice-president and general manager of the Vancouver Aquarium. If you are lucky enough, make sure you watch the feeding of the Black Tip Reef, Zebra sharks and Whiprays in the Tropical Zone. The speed of these amazing creatures as they fed was amazing to watch. Their aquarium came to life! The more I visit the Vancouver Aquarium, the more I’m amazed at the creatures who call our oceans their home. From jelly fishes, star fishes, whales, dolphins and coral the aquarium highlights them wonderfully. Thank you to the Vancouver Aquarium for inviting us on a tour and Alex for being an amazing tour guide who shared his amazing knowledge of these fascinating creatures that are on display. The electronic pop band Depeche Mode is back with their newly released song “Heaven” from their new album Delta Machine which will be released in March 26, 2013. A break from their traditional electronic sound, Heaven has a hypnotic sound to it with mixes of 50’s blues rock thrown in. Dave Gahan’s vocals is in top form as always. The video itself has some great images that resemble a lost dream. Depeche Mode is scheduled to be touring with their fist stop in Tel Aviv on May 7, 2013. Their 34 shows will take them to Europe and North America, but as of yet no tour dates have been released. Let’s hope they have a stop in Vancouver as I would love to see them live. I’ve seen them in concert before back in the 80’s for their Black Celebration tour and they were amazing. The Paperman, an Oscar nominated short by none other than Disney has hit it big on the web this week. Directed by John Kahrs, the short blends computer animation with traditional hand-drawn animation. A typical boy-meets-girl story, this short is wonderfully done with a Mad Men-esk style shot entirely in black and white. If this doesn’t give you an “ahhhhh” feeling by the end, you might need to return your human card. Enjoy the short, I know I did and brings a smile to my face every time I watch it.